Inspired by Women’s Voices For Change, I’ve decided to come up with my own Wednesday 5. I’ll be coming up with lists of 5 things- 5 excellent mysteries, 5 books I didn’t love at first, 5 characters I’d like to have dinner with… If you have an idea, leave me a comment. It’s Library Week this week. One of the things I love best about New York is the library system. I love the libraries themselves (love letters to specific branches are below.) And I love the fact that I can log into the website, and request any book or DVD or CD and it comes to my home sweet #1 library. I’ve always been happy in libraries. One of the only things I remember about my very very early childhood in San Francisco, is the murals on the outside of the children’s library building. They were jungle animals. 1. The Ottendorfer Library. Even if it weren’t within decently local walking distance, I think I would love this library. It’s a New York landmark, with funky red brick architecture. 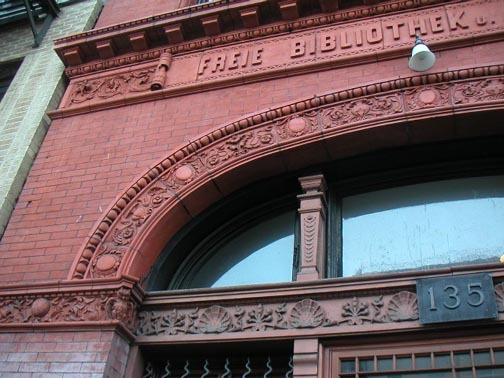 It’s small, and fun to walk into, knowing that this building has seen New York through the turn of two centuries, and it was a library the whole time. Because I’m there a few times a week, it’s very definitely my “local,” in the way that a bar might be. 2. On the other end of the architectural spectrum, in the realm of Blocky Office Nondescript, there’s the Mid-Manhattan Library. Although the Library Lions stand guard just a few blocks away, I’m more often found at the Mid-Manhattan. More “popular literature,” there. I’ve checked out everything from foodie lit to science fiction to a study of sorority culture. And stopped in to check my e-mail now and again. 4. The Vassar College library is one of the things that takes prospective students’ breath away. Weirdly enough, I loved studying in it better, after they’d built a more modern annex with brighter lights, and comfier chairs. 5. The Mattituck Free Library, out on the North Fork of Long Island, was a huge part of my childhood, especially on rainy summer days. I’d go get a pile of books and head home to sprawl, blissfully happy. One year, a skunk got trapped in the vestibule overnight, so they had to shut down for a few days to deal with the mess. Even now, decades later, there’s just the barest whiff of skunk. And so, the smell is tangled in my memory with my fondness for books.